It’s been over a year since I last got a FairyLoot box and I very rarely get subscription boxes in general, but I thought as March was FairyLoot’s three-year anniversary it could be a pretty cool box to get. As well as being the anniversary box (meaning it was purple instead of the usual black) the theme was Favourites. FairyLoot is a monthly UK-based subscription box that focusses on YA fantasy. There’s usually at least one book, with them potentially being signed and/or having an exclusive cover or sprayed edges, and about five items related to books or fandoms. The first thing I saw was a very pretty and cool scarf that was an exclusive design from Cara Kozik. The illustration on it was a couple of bookshelves with many popular and well-loved YA books on it. There was Children of Blood and Bone, Cinder, Lady Midnight and Shadow and Bone. Honestly, if you can think of it, it probably was on there. There were some Alice in Wonderland-inspired bookish socks created by Team FairyLoot. Also made by Team FairyLoot were bookish sticky tabs which I’m sure will come in very handy and an enamel pin to celebrate FairyLoot’s anniversary. There was a gold metal bookmark from KDP Letters with a quote from Strange the Dreamer. Three art prints from morgana0anagrom which were very cool and the (what I presume is) Warcross one made me interesting in picking up the book because the character design was not something I’d seen before. The other two prints were for An Ember in the Ashes and The Cruel Prince. There were also two more tarot cards of characters from Six of Crows – I think? They look like Jesper and Wylan anyway. 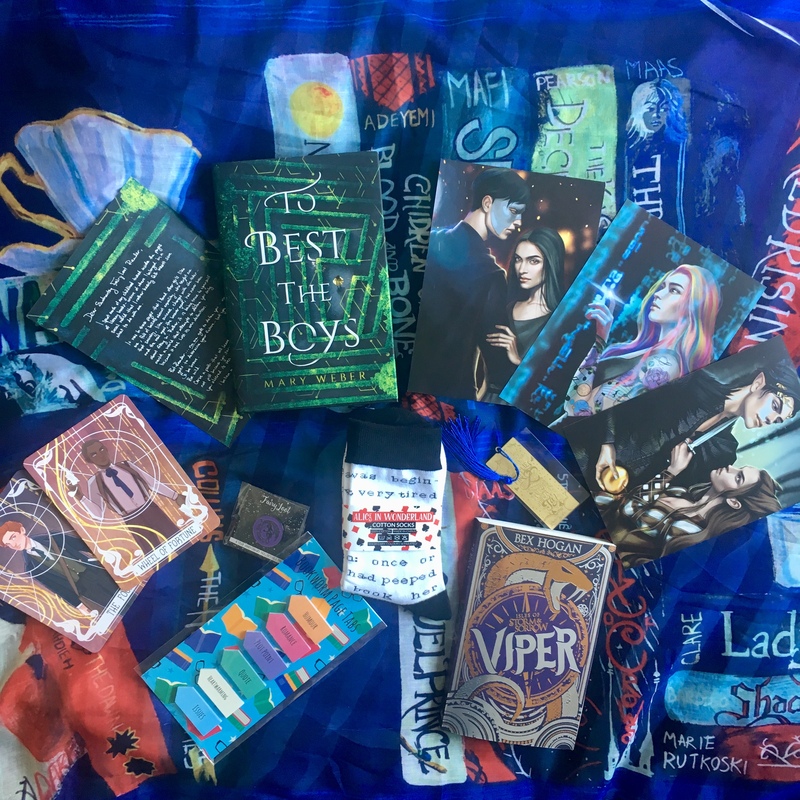 The tarot cards are something that are included in each FairyLoot box and I believe different artists will be used in every couple of boxes. There were two books in March’s FairyLoot box. Viper by Hex Hogan which is a book I’d actually seen around and I love the cover. The cover is an exclusive to FairyLoot (it’s purple rather than black I believe) and it’s signed by the author. It’s a story of magic, murder and the high seas with the seventeen-year-old heroine fighting to protect the islands from a dangerous foe who also happens to be her father. It is the first book in a trilogy. The other book was To Best The Boys by Mary Webber which I hadn’t heard of before. This book was signed by the author, has sprayed edges and came with a letter from the author which was on the back of an art print by icandrawthingz. To Best The Boys is about a competition for a scholarship to an esteemed university that only boys may enter. Rhen dreams of being a scientist and as the people in her town fall ill to a deadly disease, she decides to pretend to be a boy in order to enter the competition and save her town. That’s everything that was included in March’s FairyLoot box. If I’m honest, I was expecting something more from an anniversary edition, it didn’t feel that special compared to previous boxes, both ones I’ve received and ones I’ve seen people unbox. However, I like the sound of both books and as someone who is generally more interested in the books rather than the items in subscription boxes, I can’t be too mad. Does anyone know of subscription boxes/services that are more focused on the book than the gifts? Or are there any book-only book boxes? I do think subscription boxes like FairyLoot are pretty great, but I also think they can cost a lot if you don’t really like or care about the items. This is why I generally only get one off subscription boxes from anyone when I like the sound of the theme.